Hotelier Indonesia - SevenFold , Year 2017 is challenging for Indonesia Tourism, but the government is still very optimistic it will grow, even they targeted Tourism would contribute 8 percent to national gross domestic product, accounting for Rp 240 trillion and 13 million people working in this sector by 2019 and the government is eyeing 30th position among 141 tourist countries. President Joko Widodo's administration even has set a target of reaching 20 million foreign tourists and 275 million domestic tourists by 2019.It is responded by Tourism Ministry office to achieve that target with “Spirit Indonesia Incorporated” It is become one the priority programs in 2017. And Tourism Minister Arief Yahya, has set up another program, 10 New Bali tourist destinations as a priority to be developed in order to be at least as aligned and developed as tourism in Bali. 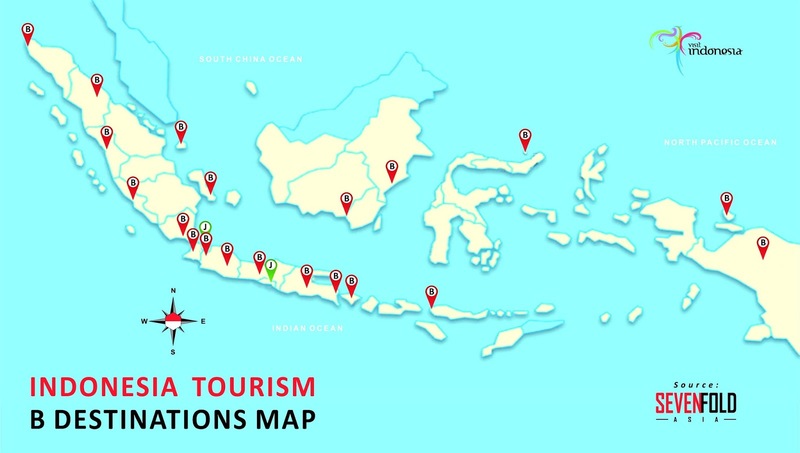 Regional tourism destinations such as Lake Toba (North Sumatra), Belitung (Babel), Tanjung Lesung (Banten), the Thousand Islands (DKI Jakarta), Borobudur (Central Java), Mount Bromo (East Java), Mandalika Lombok (NTB), Komodo Island (NTT), Wakatobi National Park (Southeast Sulawesi), and Morotai (Maluku Utara) with each uniqueness will be put forward on Government’s promotion to prospective tourists, both domestic and foreign. It is really great if those 10 new tourist destinations can be developed as tourism in Bali, but Don’t force it! said by Arief Gunawan President & CEO SEVENFOLD ASIA. “Better consider whether those destinations have met the 5G requirements yet? We should diagnose them before doing far further.” Arief Gunawan added. #1. Great Attraction consist of great Nature, great Culture and great Manmade. We may claim our attraction is the best than the others, wait, it’s not enough! Great Accessibility consist of great infrastructure and connectivity by land, air and sea. Does the attraction has great accessibility enough, at least easy to be accessed by land, water or even by air. Even it has been fulfilled, it’s still not enough! Great Facility consist of great public facility, accommodation and other support facilities. Remember, when we develop a destination, it’s not only great attraction and great accessibility, we should be well prepared from public services such as public toilet, gas station till personal services such as accommodation and or restaurant. Here we go, is it worthy to go that destination, is it value for money or greater compare to the other greatest destinations? Review it again, if that domestic destination is even more expensive compare to international tourist destination! Domestic or foreign tourist are easily to access those information in this digital era. Do not only make a local destination comparison but please do compare with international destination too. So prepare the better value for winning the destination! This is the last G, Great Management! Even though you have 4Gs, It’s still not completed. We need a professional and expert to handle the tourist destination, who can think and anticipate from A – Z, to avoid and reduce the failure. Not only that, management who can make a proper strategy from operation, finance, marketing, sales and also not less important is great service. Banda Aceh, Brastagi, Bukit Tinggi, Batam Bintan, Bangka Belitung, Bengkulu, Bandar Lampung, Banten, Bandung, Bogor, Borobudur, Bromo, Banyuwangi, Bali, Bajo, Balikpapan, Banjarmasin, Bunaken, Baliem and Biak. Beside letter B, he added letter J as special city destinations which are Jakarta and Jogjakarta. Those destinations are hot destinations and worthy as investment destinations too! Should there be any other destinations look like top destinations, they have to use B & J Destination as the selling and entry point. 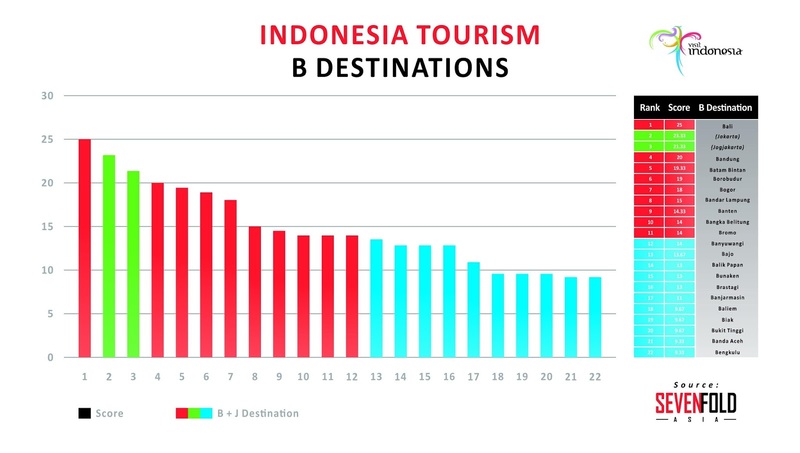 From 20 B and 2 J Destinations, Bali is still the highest rank & score Indonesia Tourism Destinations. Followed by Bandung, Batam Bintan, Borobudur and Bogor. If the Tourism Ministry would develop 10 New Bali Destinations, they should make a different approach or consider to diagnose and or should be fulfilled 5G requirements. Even Bali took more than 30% foreign tourist share whose visit to Indonesia archipelago. In his last statement, “If we want to be better Indonesia Tourism Better Future Outlook, do not diagnose wrongly and or mistreated, it will definitely drive you in wrong direction and it will only be rhetoric every year strategy!” he added. The good news is President Joko Widodo knows 5G is very important for Indonesia, he has started to repair and develop better National ‘Connection’ Accessibility! The air connectivity and land bridge are very important and crucial. And it is the right time to review those countries whose have visa-free entry for tourist from 30 countries before to set the next branding and promotion. However Indonesia archipelago remains one of Asia’s popular tourist destinations and provides some accommodations with significant opportunities for growth. Assuming a six percent compounded annual growth rate, domestic and international visitor arrivals is projected to increase to 600 million by 2022. B+J Destinations as above mentioned should prepare all facilities including accommodation. Historically, many of the economy and midscale hotel categories catered to the rapidly growing domestic markets. There are less on the upscale or luxury hotels. The influx of budget airlines in Asia and within Indonesia, have enhanced connectivity and affordability of travels. Bolstered by a healthy economic outlook, the hospitality and tourism industry of Indonesia is expected to experience a period of sustainable growth and opportunities for investors too. Arief Gunawan is President & CEO of SEVENFOLD ASIA. He has more than 30 years of experience in the hospitality, investment and tourism destination industry including executive positions with the World Trade Center, Coldwell Banker & HVS which all these based in USA and he has various senior hospitality corporate roles in IHG, Shangri-La, ACCOR, Kosaido Country Club, Ocean, Compass Hospitality and LTH Worldwide. Beside that Arief chairs as Chairman of ILTHA – Indonesia Luxury Travel & Hospitality Association, wishes that Indonesia should have more Luxury Travel & Hospitality product in this upcoming years. So that it leverages the Indonesian Tourism to the next up market level. Arief and his qualified team are ready to advise your hospitality, investment and tourism destination projects. And also they invite, welcome the luxury industries to be part and member of ILTHA.